No, the base does not get hot like the Evo. On my Switch, the air enters the cup area through the top of the cap and then exits to my lungs through the glass bubbler. The base is holding the power source and electronics. 2 separate universes. 530rasta, tonuzzi, ShayWhiteGrow and 1 other person like this. I am an avid user of my home enail and Liger at home and I use the Puffco Peak on the road. The battery life and no atomizer to replace interested me from the beginning to use instead of the Peak, but the size turned me off a little since it was only meant as a portable for me. I suppose I could use it instead of my enail and CCA Liger with sapphire, Obsidian, Sic, and quartz, inserts at home. But honestly, even if it did compete with it, I want to be able to use the countless pieces of 10mm and 14mm heady glass I have at the house. So that brings me back to getting the Switch for "portability" which is not it's strong suit, BUT I ordered one anyway. I am on my last atomizer for the Peak, and I can't stomach $40 each indefinitely. So until someone sources those cheap little ceramic heater discs used on the Peak, and sells them as atomizer rebuild kits for the Peak, I got this big, bad boy! I really can't wait to try it. My only real concern now are the inserts. I only dab now so I won't use the flower insert. From what I hear, the coated ceramic cup heats quickly but has sub-par flavor compared to the quartz or smooth ceramic inserts or even other devices. So out of the 3 inserts for concentrates, Dr. Dabber only includes the worst performing one in the box? So it sounds like personally for me, the only 2 inserts I would ever use would be the new Smooth ceramic, or maybe the Quartz. But NEITHER of these come with the unit and it will cost me an additional $80-$90 on top of the price of the unit to get flavorful dabs? I'm not bashing the product, I haven't even received it yet. But it's a little discouraging to figure out that I need to purchase items that really should be included from the beginning. Why don't you guys include a smooth ceramic cup with new units? If you are going to leave one out and sell it separately, make it the fast heating coated one and give us one we can use in crystal mode with some flavor. So, I suppose I need to get a smooth ceramic insert. Those of you who have it, how are you guys liking it? I will report back when I get it. superdang9000, MonkeyTime, DabberChase and 1 other person like this. Does anyone have an opinion as to water level the ball bubbler is meant to be filled to? It has interesting functionality, I like it, but I cannot decide where the water is meant to be. We recommend filling the water just about the percolator gaps on the down stem. You are more than welcome to add more or less, but be careful to avoid splash back. I’m confused by this description. What are the percolator gaps on the downstem you are referring to? Do you mean the percolatornun the upper ball chamber that the downstem runs through? Is it possible for you to post a photo either on here or on your own site? Is it possible for you to post a photo either on here or on your own site? Let me know if this helps. The water should be right above the slits/perc holes on the down stem. As I stated before, you can add more or less if you like, this will not harm the unit or glass attachment. If you add too much water, you may get some splash back on your lips while inhaling. Play around with the water levels and find the best fit for you. PhreedomPhries and MonkeyTime like this. I am hoping for a better than 20% discount on the Switch for this Black Friday. Oh, this is why I was confused. I was inquiring about the ball bubbler aftermarket accessory attachment. @DabberChase Hey Chase, Can you help me out with a few things? I received my Switch and tried it for the first time yesterday. I definitely tested it, several dabs in it on day one, and I must say I am struggling more than I thought I would for a seasoned dabber and enail veteran. First off my carb cap was broken upon arrival, unfortunate but it's the dabber part so it doesn't affect performance. I Tried it with a few people and everyone agreed that the standard ceramic cup isn't very efficient. It seems to burn through the same size dab with less vapor than the Peak and Rig with banger we were comparing it to. I tried all of the settings and it went from airy hits down low, to quick, thick vapor up high without any time hovering at the "right temperature"? I started to think maybe something is wrong with my Switch, But I have heard others feel the quartz solves this. So I load the quartz up and switch to crystal mode. That's when we all really started struggling. I started fairly low, At the top end of the blue spectrum. Heat-up was only a couple of seconds, which surprised me for crystal mode, I thought it heated longer. So I take a hit, and get nothing? Repeat a couple of more times, nothing again, and then a tiny wisp of vapor on hit 3. So I turn it up, this time on Cyan at the top, a little better but close to the same result. Now keep in mind, I have cycled through 6 total hits and the oil is still in the cup, no hits achieved. So I crank it up to the bottom of yellow, I get a tiny hit...I'm thinking something is wrong so I just crank it up all of the way, top of the yellow on crystal mode. Now it's hitting, not burning but hitting hard especially by the second heat-up. Is this what others are experiencing or did I perhaps get a "cool unit"? The heat-up time seems too short in crystal mode for sure. Is this just user error? Can you help or should I return the unit to the reseller? Can you help or should I return the unit to the reseller? I am happy to help. I am reaching out to you now with assistance. This is definitely not the way the unit should be functioning. I will make sure to get this figured out for you ASAP. Same thing with this glass attachment. Fill the water just above the perc. Puffitup has a 20% off coupon for this unit this weekend. sickmanfraud and MonkeyTime like this. I am considering one. Anyone know if this puffit up deal is the best deal on the Switch for Black Friday? Check cream city, 319 and free black glass. Damn, that's a killer deal. drdabber.com also has appears to have everything on sale. Taking this opportunity to try the smooth ceramic cup, as I honestly haven't been using my Switch at all lately. The Peak has emerged as my clear favorite of the two recently, but I'm hoping a better induction cup will change things up. Black Friday Sale starts now! 20% off our Swich unit and 30% off everything else, including all Switxh accessories. Special holiday bundles are available too. Happy Holidays! Hey Freddie! I am also a user of both products, as well as a top of the line plug-in enail and Liger. I am still finding pros and cons to both, but maybe I can help you enjoy your Switch more. I just got a new unit with upgraded firmware that didn't have the repeated cooldown issue, much better! My 00- unit would cooldown for 15 minutes at a time, killing a sesh. The 01- unit is much better about this. I also go the smooth ceramic insert, I do like it a lot. But I am with you, something about the way the Peak hits is very inviting. It seems to slowly milk every bit of terps from a dab and give you a ridiculous number of hits on a glob? The obvious downfall of this is the battery life and the awful atomizer replacement price. Now that I am using my handmade Peak atomizers that is more of a non-issue, but the battery is. So I am on a mission to get the Switch hitting as tasty and efficiently as the Peak with all of the amazing advantages I get with the Induction tech. So, I may like the way the Peak hits a little more now, BUT I feel like with insert advancement and playing with lower settings in crystal mode similar performance could be achieved with the Switch, but with the robustness and big ole battery. I am going to keep going back and forth, but I think the battery alone will make the Switch the clear winner. One thing that really turned me off about the Switch at first was the way the airflow to the bucket was designed and the lack of seal at mouth. Well, after testing about 15 carb caps and using the silicone ring inside out in the mouth, It's MUCH MUCH BETTER!!! First of all, if you haven't taken the ring off of your cap, turned it inside out, and put it on the inside of the upper portion of your glass...DO IT! This make it to where any big carb cap will seal on it. And if your dabber broke off of your stock one, it works just as well upside down with the seal inside the 50mm joint. So I have found 5 or so carb caps that work very well, and milk more than either the stock or bubble caps. The Bubble cap works MUCH better after you use the seal, but it has the tendency to blow oil out of the bucket unless you hit it lightly. The Chab Bro Terp trunk fit great but due to the extremely deep bucket design on the Switch, the directional air flow is hitting the side wall of the glass and not perfect. The coojo bubble also worked ok, but still not perfect. Then I found a couple of caps that I rarely use for anything, they fit my 30mm flat coil Liger, but I don't use either often. One is a Redtail glass, it's not directional which is good in this case, most directional caps just make the air hit the side wall of the glass due to the deap bucket. This works great, and even better if I use it upside down with the handle towards the bucket. It clouds up so thick! The other glass one that works better than stock I forgot who made it, but it has a very long directional snout with a slight angle so it blows into the bucket. Super clouds with a directional cap! nice. So I kept looking and trying caps, that led me to my collection of CCA Ti caps. WOW, several of the later ones work great, but the single hole storm cell cap seems like it was made for the Switch! It is similar in design to the actual Switch cap except the air inlet hole is an angled hole towards the center instead of near the edge, this seems to make a huge difference! The air is directed at an angle right into the bucket but far enough away not to splash it out. All 3 of these caps works better than the OG, but if you already have late model CCA storm cell cap, give it a try! It is the best cap I have found for the Switch so far. The other 2 glass ones right behind it and then the Switch caps. I did find another 10 that worked, like the Coojo and Chad bro as mentioned above, but If they didn't perform better than the original I didn't take pics of them for you. I am still getting acquainted with the Switch and have used the hell out of the Peak since release. I can tell you that the Peak could never be a desktop replacement for me, I simply take too many dabs in a day. Especially with company. I did however use the Switch like that this weekend. I originally purchased a unit with outdated firmware so this was my first real test. This was with myself and a few other heavy dabbers so we hit it a lot. We used all 3 of the inserts, all agreed that the Quartz and smooth ceramic would be the only ones we used often. So in this mode we played around and did notice that it was almost too powerful at times. Heating your concentrate up to full vaporization instead of slowly milking it. It would give HUGE rips but didn't seem as efficient. Again I think this could be a pro and a con, but playing with lower temps and longer hit times paired with thicker inserts and materials should help. I think we only got about 35 dabs in when the battery died. So not 100 like you would get with the thin ceramic insert, but still more than the Peak. Then I remembered that the battery was swappable! I still had my old unit to return so I swapped out the battery and was good to go! Then the value of the swappable battery really dawned on me. With the Peak, I would have been dead in the water, no pass-through charging, no swappable battery. Just waiting. With the Switch it takes about a minute to start working again when you plug it in, and if you are going for long weekends without power like I do, picking up a spare battery puts a clear advantage with the Switch. I do like the Peaks case a bit better, so I will be buying a Pelican style hard case t replace the cardboard box case, not because it's not protective, but because mine already split at one of the corners so I know it will not last long. 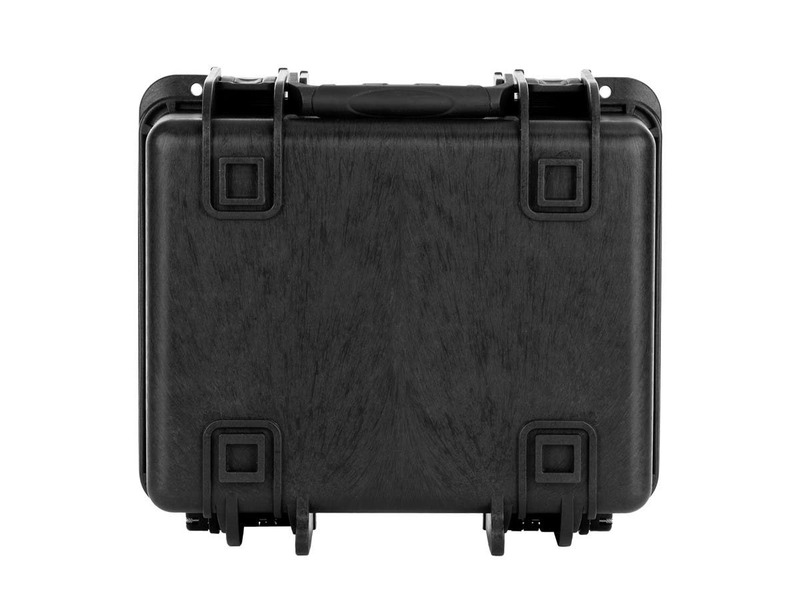 I picked up a 13" x 12" x 6" Weatherproof Hard Case with Customizable Foam. It is smaller than the stock box and about the smallest case you could fit everything in. It would have been nice if it was big enough to fit the stock foam in, but it's smaller so I will have to pluck. I will post pics after plucking. If I were buying it again I may go ahead and get the 14x16x8" to get more room, it may be the best fit. If I get a custom rig I may upgrade to it. I have a huge 22x14x8", but I don't want to carry that beast around. I suggest using the smooth ceramic or Quartz at a very low temp in the dark blues but set the hit time to a long 25-30 seconds. This is the best way to get good flavor and lots of milky, tasty hits instead of blasting through a glob with 2 rips! Both are nice to be able to do and require a little technique. I am really enjoying the Switch so far and I love the Peak too! There are definitely valid reasons to love both and room for improvement on both, but I am certainly happy I picked up the Switch even though I already own a Peak! If I had to pick just 1 portable dab rig, I'm leaning Switch right meow! Playing with different inserts, temps, times, and carb caps along with the silicone cap seal make a big difference. Plus I just ordered some 50mm glass joints from Dr. Dabber and I am going to have a custom glass piece made soon! superdang9000, freddiegibbs, DabberChase and 4 others like this. I just received my Switch and have a few questions. After four small dabs of 'Grape Inferno' PHO budder, the water bubbler has become pretty clogged to the point of restricting airflow. Is this due to impurities in the budder? Is there a 'cleaner' concentrate I could use, such as shatter, wax, or ?? Can the bubbler be used dry or are the vapors too hot for comfort? Thanks fellow Switch owners. This is my first night with this device, and concentrates in general, so I suppose I have a bit of a learning curve. I have found the bubbler cools the vapor well even with zero water. I am using the smooth ceramic cup with the 4 blue setting. metal and ceramic tweezers got like 75% of the stains away, still working it though! I use a metal scour pad with 91% iso on the ceramic inner area of my VB2 to get all the harder to get stuff off and it works perfectly. And the oil gets cooked to the sides of that pretty bad right above the heat source after a while. I won't have my Switch until this thurs so I can't test it out with it yet tho. I don't see why it wouldn't work for that too tho. Hope this helps. I am reaching out to you now. This should not be occurring with your glass attachment. I will make sure to get this resolved for you ASAP. Looking to buy one of these.. still have to read through these 20 previous pages though. Stupid question... I smoke hot dabs... like I crank the email up to 999 and I still want hotter than that. It leaves less residual smoke in the air etc and works better for me when hotter. I dont use carb cap normally. Wow. To ask that anyone suggest to you how to use your vaporizer irresponsibly, is pretty amazing. It is roundly recognized that vaporizing cannabis oil at that temperature is straight up HARMFUL TO YOUR HEALTH and creates cancerous compounds that you are ingesting. “It works better for you when hotter”? Yeah - that’s the cancerous poisons you are unwisely “enjoying” getting high on. Think twice. Then think again. Way way way not wise to vape anywhere above 700 degrees. CalyxSmokr and justcametomind like this. I'm thinking I could maybe hit in in cleaning mode.. or would this not be possible? @Halfqq Dabbing at 999 F means wasting your dab. That's why you feel you need more. You probably feel you need it hotter because what you inhale is almost inactive? If you went down to usual dabbing temperatures you would absorb much more THC imho and wouldn't waste all the flavor and terps.